Indigenous people have lived in the Arctic for thousands of years. Europeans began venturing into the Arctic around one thousand years ago, as Russians and Scandinavians ventured north and west, exploring new lands and searching for shipping routes. Scientific exploration began in earnest in the 18th and 19th centuries, as people realized that there was much to learn about the Arctic climate. In the late 1800's twelve countries participated in the first International Polar Year expedition, establishing new research stations and conducting extensive studies of oceanography, sea ice, and biology of the polar regions. The expeditions catalogued new islands, animals, and plants. While many nations have contributed to Arctic research, Russia in particular has a long history of exploration and science in the Arctic. Large parts of Russia lie above the Arctic Circle, and the country is home to the three largest communities in the Arctic. Russians first started exploring the Arctic as early as the 11th and 12th centuries, and carried out a number of expeditions in the Russian Arctic starting in the early 18th century. In 1937, Russia established drifting stations that floated on sea ice in the Arctic Ocean, which laid the foundation for later studies of sea ice. For more information on Russian research in the Arctic, download the Environmental Working Group Arctic Meteorology and Climate Atlas. 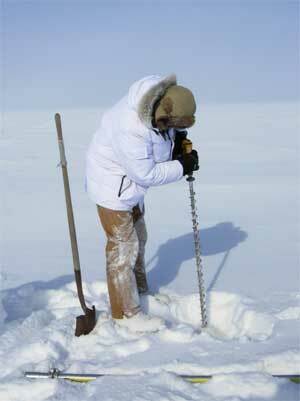 NSIDC Scientist, Mark Serreze, drills into Arctic sea ice to measure its thickness. Today, scientists study the Arctic to learn more about how climate and weather are changing. They investigate how Arctic climate and weather interact with the rest of the world, and are working to understand how climate change will affect the region. To study the Arctic, researchers sometimes travel to the field to conduct experiments or make observations. They study the properties of snow and sea ice, digging snow pits to examine the properties of snow, or measuring the thickness of sea ice by hand to determine how the ice cover is changing. Researchers also study the frozen ground and permafrost that covers much of the Arctic lands. And biologists research the unique plants and animals that live in the Arctic. In 2007 to 2008, researchers from around the world participated in another International Polar Year, launching international expeditions and collecting vast amounts of data about the Arctic and Antarctic regions. Researchers are also beginning to collaborate with native people, who often know a lot about the weather, plants, and animals that they see and rely upon. For example, Inuit in northern Canada noticed that weather patterns in their region had changed in way that scientists had not noticed. When researchers listened to the Inuit and collaborated with them, they documented new changes in local weather that they think are related to climate change. The Arctic is a huge region, and scientists cannot conceivably measure every bit of it in person. So researchers also use other tools to study the Arctic from afar. They make observations using remote sensing, a variety of tools that allow them to measure factors that they cannot see directly, or which are too big to observe in person. Instead, they mount sensors on airplanes or satellites to record data. For example, satellite data provides estimates of the sea ice cover on the Arctic Ocean as well as weather patterns over the Arctic. And scientists from NASA recently flew a series of missions over the Arctic during the IceBridge project, to study details of Arctic sea ice thickness as well as changing glaciers in Greenland. Researchers also combine their observations and data with computer models that try to replicate weather and sea ice conditions in the Arctic. Models can help scientists understand what effects higher temperatures will have, for instance, or whether declining sea ice cover on the Arctic Ocean will add to climate change. Novgorodians reach the White Sea coast. Willem Barents (Dutch) and crew become the first Europeans to overwinter in the Arctic on the west coast of Novaya Zemlya after discovering Spitsbergen. William Baffin (English) explores northern Baffin Bay, but his maps are lost. Fedot Alekseyev Popov (Russian) finds easternmost point of Asian continent by boat. First Kamchatka expedition of Vitus Bering (Russian) after a 5,000 mile overland journey. Russian explorers attempt the Northeast Sea Route; members of the Great Northern Expedition attempt to map the Arctic coast of Siberia. Edward Parry's ships (English) overwinter at Winter Harbour, Melville Sound; ice prevents them from completing the Northwest Passage. William Scoresby (English) compiles a summary of meteorological observations from his whaling expeditions. Ferdinand Wrangell (Russian) maps the coast east of the Kolyma River. Fedor Petrovich Litke (Russian) charts the western and southern shore of Novaya Zemlya and Matochkin Shar Strait. Adolf Erik Nordenskiöld (Finnish) sails the complete Northeast Passage over two seasons in the Vega. 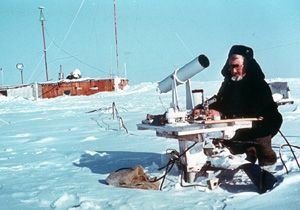 First International Polar Year: twelve meteorological stations established. Norwegian Fram expedition (Fridjof Nansen). Roald Amundsen (Norwegian) traverses the Northwest Passage. Robert Peary (U.S.A.) attempts North Pole by dogsled. Ya. I. Nagursky (Russian) makes first arctic flight. Norwegian Maud expedition (Harold Sverdrup). First airborne ice reconnaissance flights in the Kara Sea (Russian). Richard Byrd and Floyd Bennett (U.S.A.) claim to have reached the North Pole by air. The airship Norge flies over the North Pole from Spitsbergen to Alaska. The airship Italia crashes; USSR and other countries mount an international rescue effort. Icebreaker Sibiryakov navigates the Northeast Sea Route in one season. Second International Polar Year: ninety-four arctic meteorological stations established. The Cheluskin sinks in the Northeast Passage. Passengers are rescued in April 1934. First Russian drifting station, North Pole 1, is established. 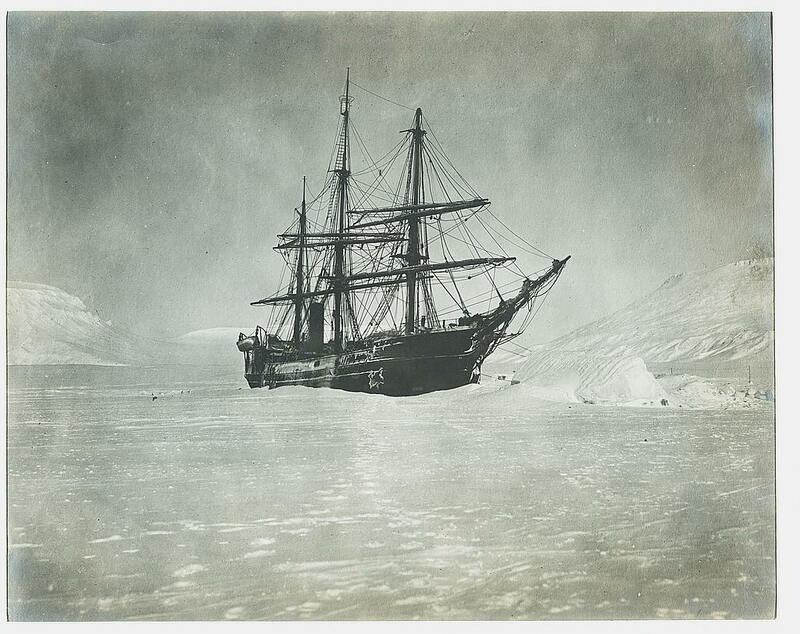 The Georgy Sedov expedition (Russian). The St. Roch (a Royal Canadian Mounted Police ship) sails the Northwest Passage in both directions. Russian "Flying Laboratory" program begins. World Meteorological Organization (WMO) is established. 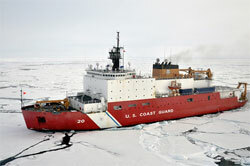 U.S. Air Force establishes the ice island T-3 as a research station. The International Geophysical Year (IGY). The World Data Center system is established. The USS Nautilus crosses the Arctic Ocean beneath the ice. Becoming the first submarine to cross the Arctic Ocean. As part of IGY activities, U.S establishes Drifting Stations Alpha and Bravo (T-3). WMO's Working Group VIII is formed to facilitate data exchange between Russia and the U.S.A. The last Russian drifting station, North Pole 31, closes. U.S. - Russian Environmental Working Group convenes. 1993 - 1999 US Navy program, SCICEX, begins in an effort to utilize nuclear powered submarines to explore the Arctic Ocean. Present Scientists continue to study the Arctic via ice breaking ships, submarines, dog sleds, floating ice camps, snowmobiles, and many more.